Fire extinguisher services are governed by the California Code of Regulations. The CCR requires that fire extinguishers located in businesses be tested every year, and it requires that they undergo recharging services every 6 years from their manufacturing date. For hydrostatic testing, the CCR requires service every five to 12 year. The good news for Stockton and businesses throughout the San Joaquin Valley is that AAA Fire Protection Services offers high-quality services without the budget-breaking prices. We offer a complete line of fire extinguisher services, including fire extinguisher sales. 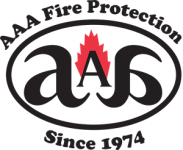 As a fire suppression and fire prevention company, we have over four decades of continuous service. We work with businesses just like yours to bring them up to compliance and then keep them there. You can put our expertise to work for your business by scheduling a free consultation or fire extinguisher services. What you can expect is that we will service your fire extinguishers and point out any infractions that we see. This allows you time to fix them before government agencies issue citations. For more information about working with us, just give us a call at (800) 543-5556.